Tomorrow, courtesy of Ryanair, I fly to Dublin to to take part in another conference for priests. 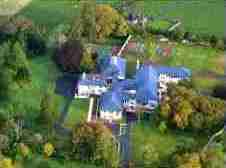 This time the venue is the Lismullin Conference Centre in the Diocese of Meath. Bishop Michael Smith, bishop of Meath, will be joining us and I look forward to hearing how things are vocations-wise in his diocese. I also hope to meet Fr Eamonn Bourke, the new Vocations Director for Dublin. He has been in contact asking permission to reproduce some of the material we have published here in Southwark. On Tuesday I will be talking of 'Promoting a Vocations Culture'. It will be interesting to speak in Ireland. Although we have much in common, we are also two very different countries facing different pastoral realities and I suspect this will be reflected in the discussion. At some time I hope to have an opportunity to show them 'Fishers of Men'. It went down well on the In-Service day for priests and will, I hope, serve to remind participants at the conference that whatever different experiences we may have, the essential task in vocations promotion is always the same: putting young people in contact with Christ. In Spain, the DVD 'fishers of men' has also made great things in young people. I'm going to watch it next Friday 24, with 6 people who are interested to 'make something remarkable' in their lifes. I hope you and your parish will be praying for it. The chuch is big and one at the same time!!!. Un abrazo. Thanks for the message Ful. Grassroots has certainly dsone the whole Church a service with the production of 'Fishers of Men'. I hope it will bear fruit also in Spain. I'll pray that you get a few vocations out of your work.